Various industries such as mineral industries including cement plant, some kinds of chemical plant, paper and agro industry have been using imported rotary kilns, rotary dryers and related equipments. 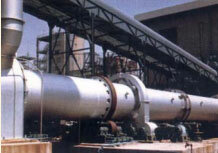 Now, SBM can provide you with China made rotary kiln and rotary dryer. As a pioneer in the manufacturing of rotary kilns and rotary dryers in China, we proudly offer our products which will best suit your need in increasing productivity and enjoy the benefit of careful attention to energy saving, easy maintenance, prevention of pollution, and competitive price of the products. We are not only paying our attention to provide new equipment installation of kilns and dryers for your industrial plants, but also can help you in improving any part of your industrial plant by modernization and/or repairing of your kiln, dryer and its system. More importantly, we provide the related technology regarding system establishing for combustion control, lining method selection, exhaust gas treatment, material handling system before and after kiln and dryer. Furthermore, we are extending our range of products to rotary cooler, band dryer, stationary furnace including electric heating furnace and other type calciner. • Lime, dolomite clinker, hamotte material, magnesia clinker, magnesium loss. • Kinds of ore for metallurgical process. • Ferrite, perlite, iron oxide, titanium oxide, pigment, hot charging flux. • Activated coal, oil cokes. • Nickel hydroxide, nickel sulfate, sodium bichromate, electrolysis sediment of copper.